With Butcher, Nicolas Billon has written an exciting Canadian thriller that is sure to find wide success. Its subject matter may be revenge, justice and genocide, but it is the play’s taut construction built on sudden twists and revelations that is its primary virtue. Under director Weyni Megesha, Why Not Theatre and Butcher’s Block have given the play a stunning production with first-rate performances from the entire cast. When the play had its world premiere in Calgary at Albert Theatre Projects last year, it was set in a generic large Canadian city. The present production is set not just in Toronto but in a police station at just about the same location as The Theatre centre where the play is running since CAMH just down the street is mentioned. The time is Christmas Eve with a tiny Christmas tree twinkling on a filing cabinet at the back of the office. The play opens with three men on stage. One is an old man (John Koensgen) in a foreign military uniform wearing a Santa hat. He says virtually nothing but when he does speak it is in a Slavic-sounding language that no one understands. Inspector Lamb (Tony Nappo), the police officer on duty is anxious to get home to his wife and two children and is trying to determine who the old man is and why he has been dumped at the station with a meat hook around his neck bearing the message “Arrest me”. The note has been written on the business card of Hamilton Barnes (Andrew Musselman), an intellectual property lawyer, so Lamb has called him in to see if he can identify the man. Barnes claims to know nothing about the man or how he had his business card. Lamb has determined that the man speaks Lavinian and has called in a Lavinian translator to help him question the man. When Elena (Michelle Monteith), the translator arrives, the questioning begins. What transpires for the rest of the play is revelation after revelation, with some gruesome onstage violence thrown in, that uncovers much more than the old man’s long-hidden secrets. 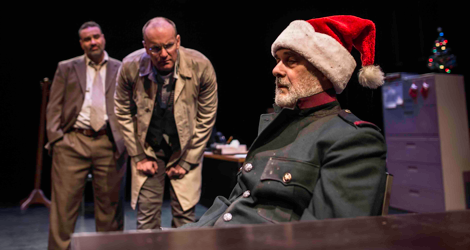 Since the play depends so much on surprise for its effect, I can say very little about the plot except that the translator, recognizing the man’s uniform and name, suspects that he is a war criminal guilty of genocide in the Balkan country of Lavinia. Billion has named the country after the character from Titus Andronicus to receive the most horrific sexual and physical abuse in all of Shakespeare. The structure of the play is quite tidy. The first twenty minutes set up an unusual but recognizable situation. The next sixty minutes, following the translator’s entrance, proceed to undermine every aspect of what we thought we knew from the first twenty minutes. The way Billon undermines his initial set-up is breathlessly ruthless. In fact, he actually goes too far in his final two plot twists since, if considered too long, they turn a barely likely story into an improbable one. Mengesha was the director of the world premiere and Koensgen, Monteith and Musselman all created the roles they are now playing in Toronto. This gives the production a lived-in feel and an unbeatable natural flow. 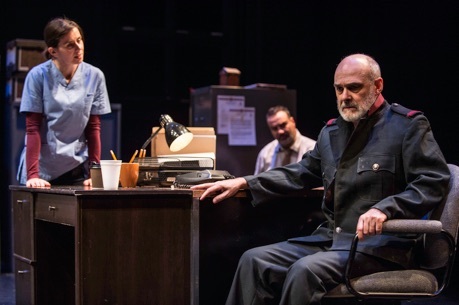 As the old man whose name is Jozef, Koensgen gives an incredibly intense performance, especially considering that it is entirely in Lavinian, a language that Christina E. Kramer and Dragana Obradović invented specifically for the play. The range of moods from apathy to rage, from bitter humour to fear, that Koensgen is able to communicate is as complex as it is impressive. We don’t need to understand his precise words since his acting is so powerful. As Elena, Monteith has quite a journey to make from a seemingly impartial interpreter acting for Lamb to a chillingly merciless woman who has all the men in the room at her command. Musselman’s character Barnes has a parallel journey to make. He begins as an annoyed intellectual, unhappy with having to waste his evening in the company of an over-jolly police inspector and a seeming madman. He and his placid façade are soon broken when the course of events push him in extremis as he suffers and inflicts horrific harm. As Inspector Lamb, Tony Nappo starts the evening off on a misleadingly humorous note as a jocular ordinary guy, a hockey fight-lover and bad punner, oblivious to how his ignorance and chumminess grates on Barnes. As the action continues, however, his glibness is squashed and Nappo reveals Lamb’s apparent puddle of fear. Weyni Mengesha expertly directs the action as a gradual crescendo of tension, beginning with the low-key exposition and gradually ramping up the pressure until violence seems both the most natural and most terrifying escape valve. If Billon thinks he has built any deeper meaning into this thriller, he is mistaken. Too much of the dialogue is taken up with plot and action for there to be enough time for significant reflection or debate. For a thriller with a similar theme but far fewer plot convolutions and more moral ambiguity, one need only look to Death and the Maiden (1991) by Chliean-American author Ariel Dorfman. Billon has deliberately set the events on Christmas Eve, but never explores the heavy irony this implies since what he depicts is the very opposite of “peace on earth, good will toward men” (Luke 2:14). While the last important words of Barnes would support the New Testament response of forgiveness as an end to conflict, Billon ends the play, unsatisfyingly, with a vision that seems to justify revenge. Billon does not give us enough information to know whether this vision belongs to only one character or represents his own provocative worldview. Therefore, it is best to regard Butcher as the skilfully managed, high-tension emotional ride that it is. If you’re looking for a thriller that alternately draws to to the edge of your seat and pushes you back to squirm in it, Butcher will fit the bill perfectly. ☛ Note to Nicolas Billon: The Achilles’ tendon is the thickest tendon in the human body. A person wielding a meat hook, therefore, would have difficulty severing that tendon since only the point of a meat hook is sharp. Similarly, as a surgeon has informed me, a person could not tear out an Achilles’ tendon with a hook without using extraordinary strength. To be believable the attacker needs an extremely sharp knife and even then will require an unusual amount of strength. Photos: (from top) Tony Nappo, Andrew Musselman and John Koensgen; Michelle Monteith, Tony Nappo and John Koensgen. ©2015 Dahlia Katz.